If you arrived here from Heidi's blog, you are on the right track. If not, you will want to start at the beginning of the hop HERE. The new Peachy Keen stamps ROCK! I had so much fun creating with these stamps. Although three of the sets were intended to be get well/sympathy sets, Kathy got the ingenious idea to create an accessory face set to go along with these sets so you could make them look happy. The sets I was assigned to was the PK-287 Ballin' Bunnies and the PK-291 Sampler Package of Faces to swap the faces. I loved so many of the sets that I had to do more than one project and I mixed and matched the greetings from two of the sets in my projects. The other set I used is the PK-288 Skunk Cheer Up. Kathy is not only giving away several awesome prizes on the PKS Challenge blog, but she is also awarding a $25 gift certificate to each of the Design Team members to give away to their readers! How awesome is that? So, are you ready to win some prizes? Leave a comment here and you have a great chance of winning a super prize! Take the time to visit the other stops and you increase your chances of winning! Please check out the instructions for these projects BELOW the hop list. I stamped and cut out two extra tears and added glitter. Notice the stitches on the heart? Check out all of the other great hop stops for even more PKS goodness! 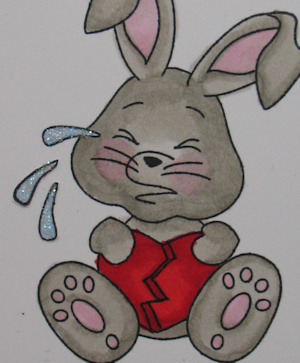 For the Bunny, you can use masking to replace the sad face. Heidi has a great photo tutorial on how to do that HERE. 1) Fold card stock in half and sharpen crease with bone folder. Cut at 3 1/2" on opposite side of crease to the center fold line as shown. 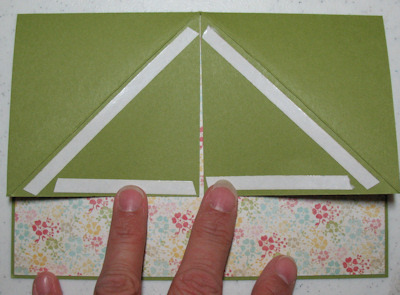 2) Fold the inside top corners of the 3 1/2" x 3 1/2" top sections to the lower outside corners as shown. 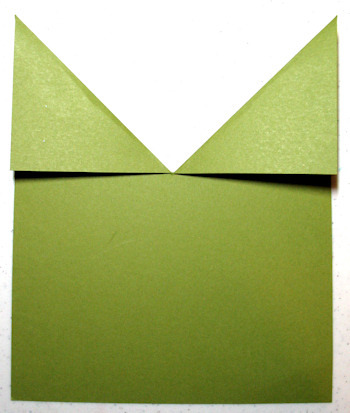 Unfold triangle and fold flaps down towards bottom of card as shown in step 3. 3) Apply strong adhesive to triangular flaps as shown. Attach 3 1/2 x 3 1/2" pieces of soft sky. 4) Embellish card. 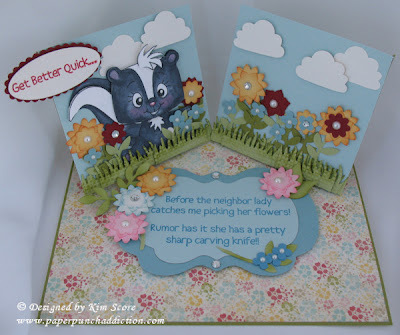 I stamped, colored and cut out skunk. The flowers were created by layering Boho Blossom punched flowers and the small flower for the Itty Bitty Punch pack. I used the jewel pearls to embellish. Stems of the flowers are from the 2-Step Bird punch. 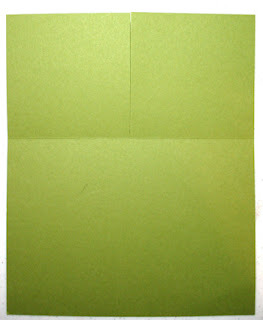 The grass is die cut and embossed with square lattice embossing folder. Clouds are from the 2-Step Cupcake punch. 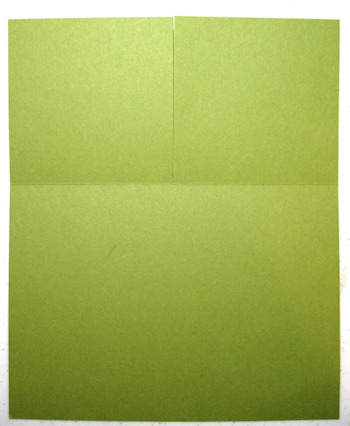 For the inside of the card, cut a 4 7/9 x 6 7/8" designer paper. Stamp and die cut greeting. I used Nestibilities Label 14. The designer paper I used is from the Flea Market line by Colorbok. Oh my gosh!!! that second card is just perfect!!! TY for sharing!!! I love the easel card!! So cute! I'm going to have to try this as soon as my company leaves this weekend. As always Kim, a beautifully presented and VERY clever design on both your cards, with the added bonus of illustrated instructions. Two stunning creations indeed! The stitches on the heart were a great touch. These sets are so cute. Great projects! I love the double twisted easel card! I LOVE your IDEAS! Thanks soo soo much for the written instructions! I will definitely visit your blog often!! WOW your cards are sooo AMAZING!I love the great new PK stamp sets. Oh Kim!!!! I think I am in love!!!! That skunk card is just flippin' fabulous! I am so happy that you put a tutorial in. I can NOT and I repeat NOT wait to try this!! Thanks for sharing your talents! Adorable cards! I think this is my favorite release so far! Oh wow both projects are fantastic Kim. I love both card shapes and definitely will try them! Thanks for sharing the tutorials for both! Great job! You are so talented! Thank you so much for sharing your talent with the rest of us! Love your cards!! they are amazing! Awesome cards. Love the tutorial. New follower. These are so sweet! Thanks for sharing your tips! So delightful! And those stitches in the heart - oh my! Lovin' your cards. Love the skunk in the garden. so cute!! Thanks for sharing how you made it!! Cute cards. Thanks for the instructions. Such cute cards! They are so sweet. How cute!! I love both your cards!! Very cute cards and tons of little details, I love them. totally kickin ! Loved that you included instructions, that is so awesome!thanks! Fantastic job! You cards are both adorable! TFS! oh, your cards are so cute. Love the easel car, will def have to try that. Fabulous cards! The skunk card is fantastic! Super cute cards... Love this set. I love how you did the inside and out! Really cute! Very cute cards! I am now following you so I can come back later to see how to make it!! Your cards are so cute. I love the T Slide card. Thank you so much for sharing the instructions. Wow love both of your cards!! The Bunny is so adorable! I also love the little skunk, very cute! Thanks for sharing! These are sooo SWEET!!!!! Great coloring!! These are adorable:) Thanks for the instructions! A W E S O M E !! I've never seen this kind of card! Will definitely have to give it a go...and soon! Wow! These are super adorable! I can tell you put a lot of love into these...they are just gorgeous! Thanks for showing how you did them too! Beautifully done! That 2nd card took my breath away at all the detail! Adorable cards! I especially like the one with the skunk. TFS! Cutest creations. I love these faces. Thank you for your instructions. Have to try that. Thanks for sharing. Love the card. Thanks for the instructions too. OMGosh they are sssooo cute, love the new stamp set, peachy keen did it again! Great cards! Thanks for the info on the twisted easel card, haven't tried one of those yet. WOW!!! Totally amazing! TFS instructions on how to create such masterpieces!! Super cute...i just love these..TFS! Great projects. Thanks for sharing the details. Wow! Your projects are wonderful. I love them both. Great instructions. Thanks for sharing! So cute. The glitter on the tears is a great touch! Such cute projects with the new PK stamp release. LOVE the one with the skunk. Great stitching on the heart too! Cute card! The glitter on the tears is a great touch! Love the second card. I can't wait to try this style. How cute are these, I love them all. I can't wait to order some. Love your blog! They are such adorable cards!! Your so talented! Thanks so much for sharing!! Super cute!! I love the skunk card!! Adorable cards, Kim! Love how you masked the face to add a new one. Great idea! Thanks for the tutorial! Soo cute! Love how you added extra tears and added glitter to them. I'M READY! These are absolutely, incredibly awesome (the stamps and especially your cards). Can't comment any more, have to get over there and order them. I love all these cute cards and the adorable characters! Oh my gosh I am in love with the skunk card you made! And thank you for the pictures and explaination on how to make it... plus the inside of the card is hilarious! I couldn't help but laugh reading it! Thanks! TFS your ideas with us & for a chance to win!!! Really cute cards. Love those faces. OMG! Wow....your cards are absolutely adorable! 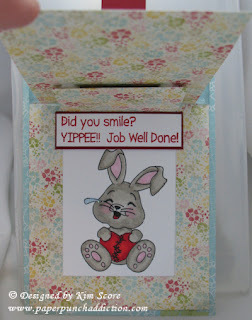 Love your projects, esp the easel card, thanks for the tutorial. Too darn cute!!! Thank you so much for the tutorial too!!!! Very cute cards! Thanks for the tutorial. 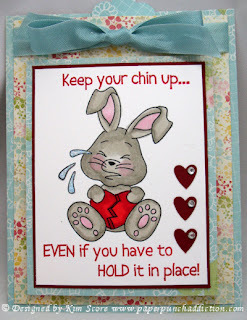 Great cards, love, love the easel card, so creative! 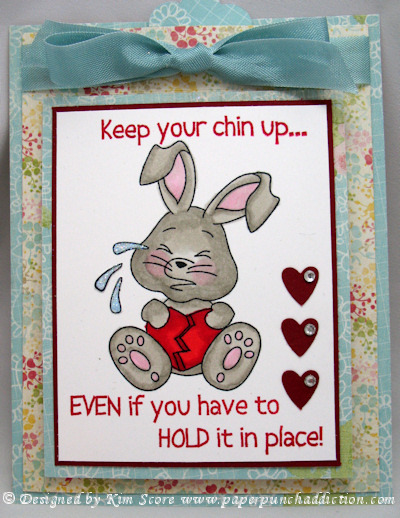 Adorable cards.... love your easel! I will be making that soon. These are super dooper cute!!!! Absolutely adorable!!! Thanks so much for sharing. love this idea!!! So cute!! thanks for the tutorial!! Cute! As always! Thanks for instructions as your cards are always so much fun to CASE! WHat wonderful cards and love the details! Very cute cards and thnks for the instructions to complete them. Love the card and your ideas. Just became a follower today and know I am going to enjoy your blog. Thanks for the tutorial...how adorable are these new images?!? GREAT projects! I just love the extra stitching on the heart! What a cute touch!! and thanks for the tutorial! I love experimenting with different types of cards!!! WOW what awesome work. am a new follower. So cute ... adorable.. love PK releases... and hop .. so much fun..
Love it, and thanks for he great tutorial too! I love your blog. I check it almost every day for ideas. I'd love to win. Please enter me into the contest. 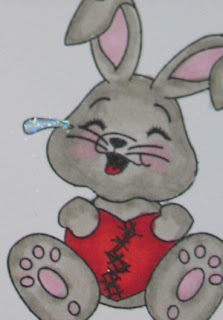 I voe the glittered tear drops and the stitches on the heart! Kim Thanks so much for including the directions to the double twisted easel card, it's Awesome! I've made 2 already! I think my brain is close to going on overload! I enjoy seeing all the creations that have been done for this hop. I hope someday I will be half as creative as you have been, I like all the cards I have seen on this site hard to say which one I like the best, like them all for different reasons.